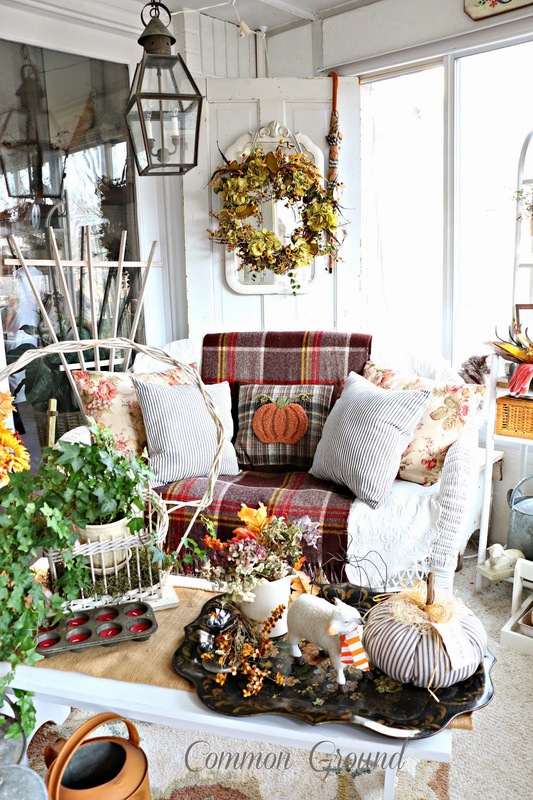 Thought I'd share a few of the little changes that have taken my sunporch from Halloween to Thanksgiving. 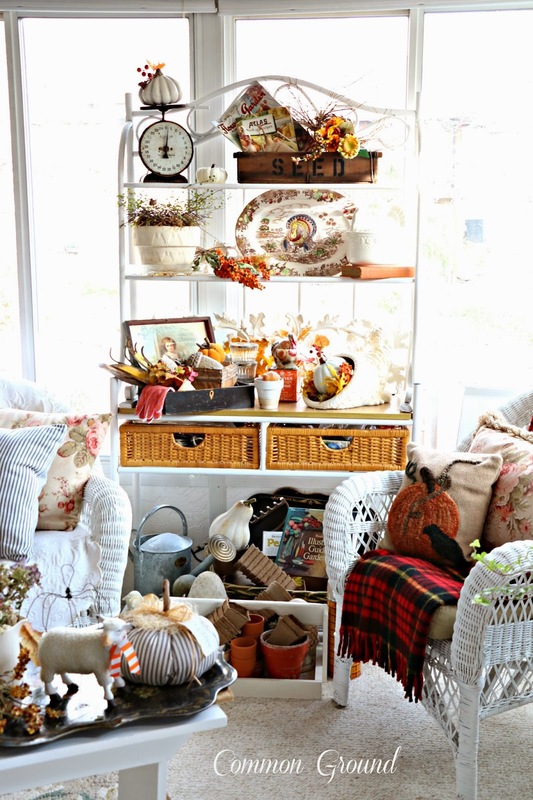 I brought out some of my vintage turkeys, my wool plaid throws, and my hooked wool pillows. I always look forward to this time in November to make the sunporch all warm and snuggly. My passion for plaid goes wild in the winter, and if I could drape a tartan plaid blanket over every surface I would. hmmmm.... I may have already done that. 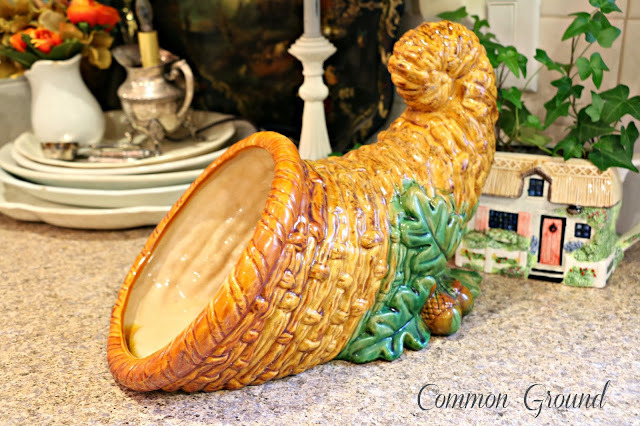 I almost forgot that I had purchased this ceramic cornucopia on sale last Thanksgiving. I think it must have come from Hobby Lobby, and was still wrapped in paper and in the sack, as it had been sitting on my shelves in my workroom since last winter. 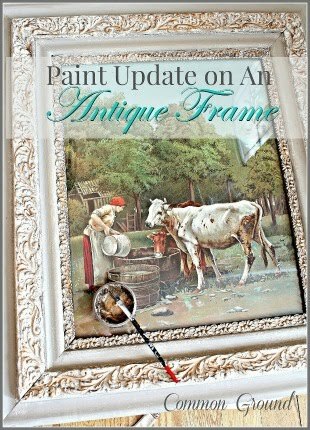 It didn't start out white, and I bought it knowing full well that it would have to go under the white paint brush before I could use it. Yep, here it is, not bad, just not what I had in mind for it. Some Old White ASCP did the trick with a little shading with some gray and brown craft paint, and a coat of Minwax Liquid Poly. much better. 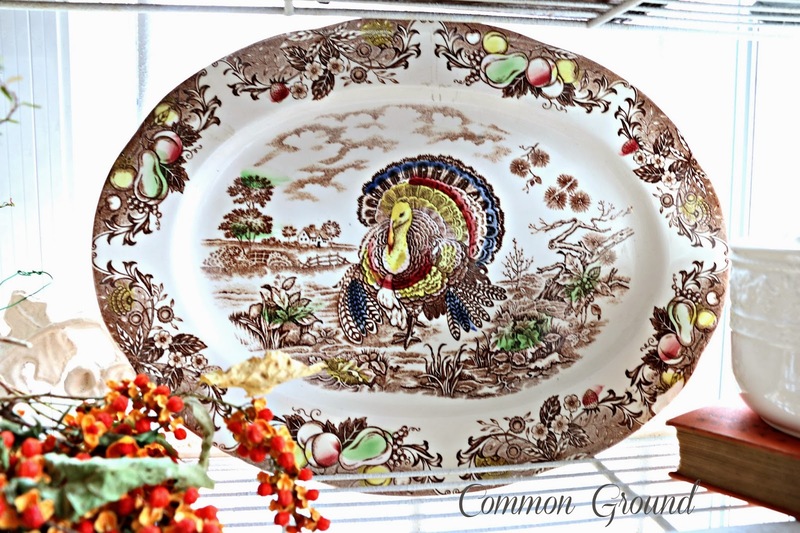 I have several turkey platters; this is one of the less expensive ones. 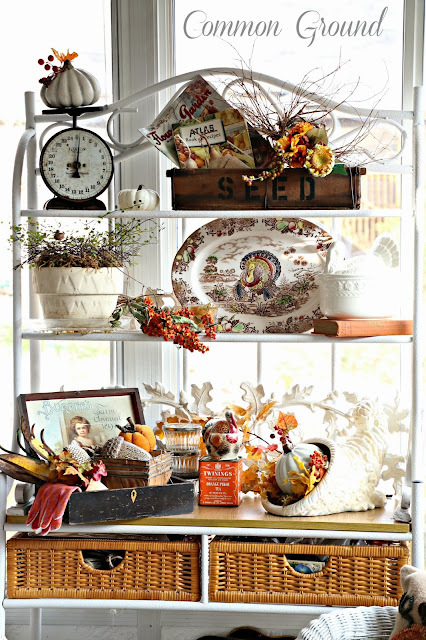 They're pretty much to be found at any flea market in the Fall. 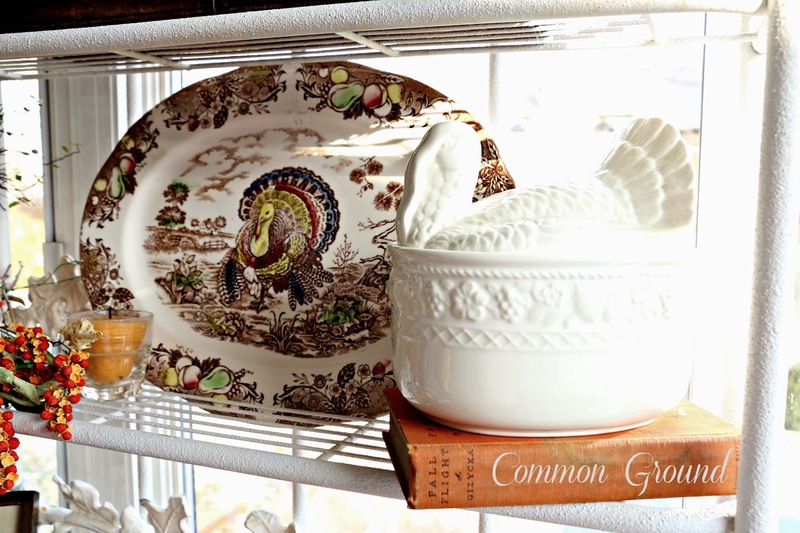 Keeping the platter company is my white Turkey Tureen perched on a book. 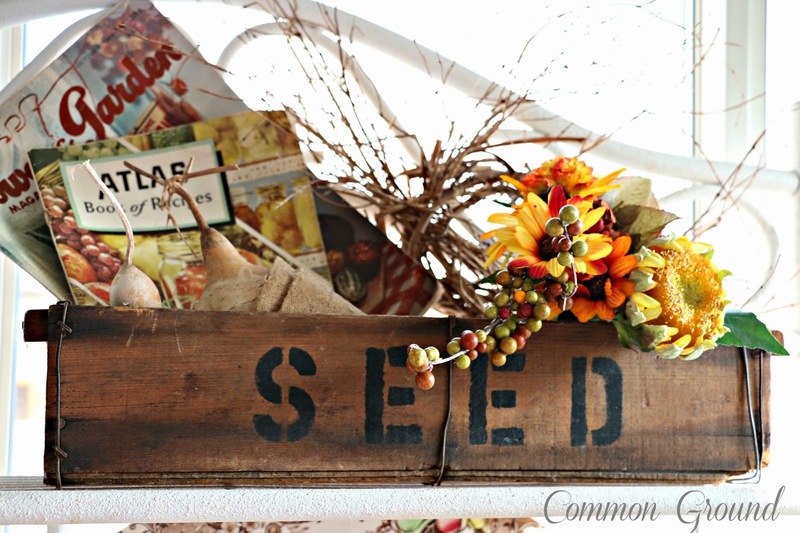 My Fall "Seed Box" I made last Spring. Click Here if you missed how I made my own "Vintage Seed Boxes". 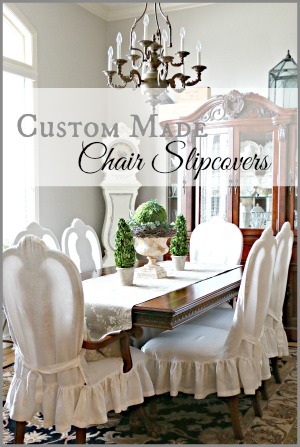 I'll show you how you can make one for yourself. 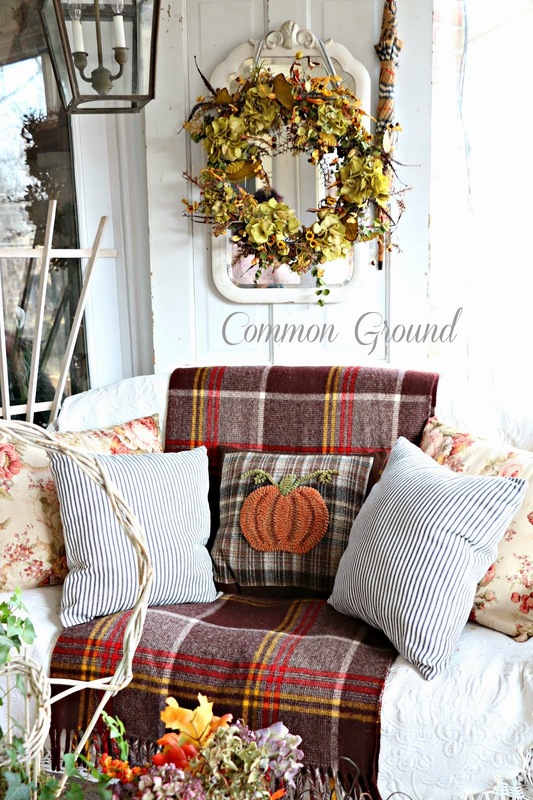 One of my favorites in this transition is just to layer on the wool plaid blankets. Here's one on top of an old white mattelasse bed cover that I've been using. 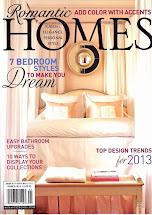 I love using white and neutrals as a base with my furniture, but going all white out here just doesn't work. It's cold and lifeless, so it always gets loaded up with seasonal color. I still have a little more "Thanksgiving" to share with you (I like to keep my web photo diary up-to-date), then I'll be doing the transition to Christmas. About now I always start removing the orange leaves and adding in my evergreens. My little Autumn trees are up now, and I'm enjoying the lights in the evenings, looks so cozy. Once I get my trees up, Christmas comes in little by little. Do you have ways to transition from Thanksgiving to Christmas without it being totally obvious to your Thanksgiving guests that you have ants in your pants for Christmas decor? Everything looks stunning! I love your use of the plaid throws, with the wicker. I'm just going to have to steal your idea! 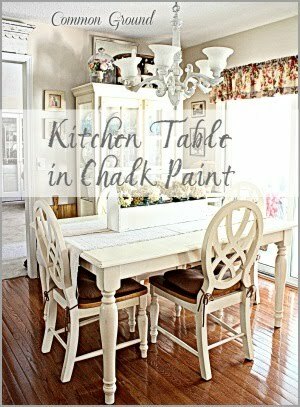 You have such an eye for decorating, and great ideas to go with it!! 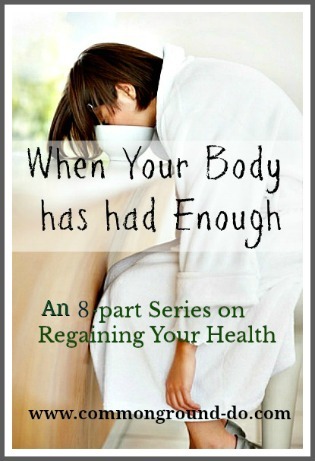 Hope you are feeling well! It all looks so cozy and inviting! love the mix of plaid, floral, and stripes. the makeover of the cornucopia is outstanding. I was shocked to see the original color. 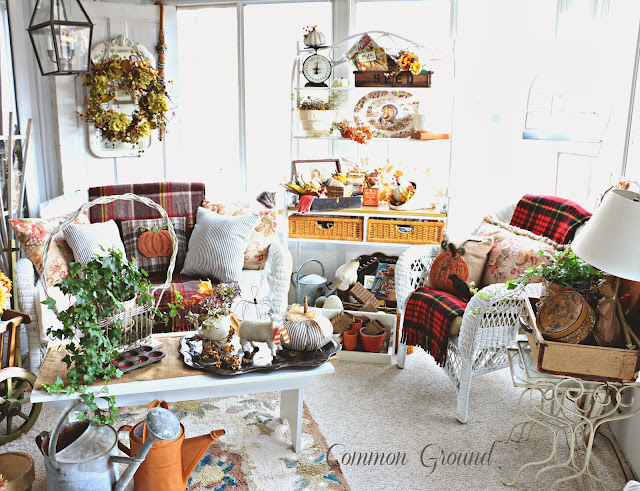 I always look forward to the seasonal changes you make to your gorgeous porch and you have done it again with creating a stunning fall decorated porch…I marvel at every beautiful detail…Such a cozy and warm place to be! Stunning! So much beautiful detail. I especially love the plaid blankets. Your porch is beautiful, inviting and cozy. I love all your plaid throws. All your Thanksgiving looks so pretty. 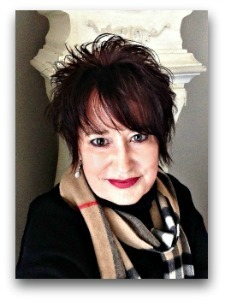 Oh you have such pretty autumn surroundings, Debra. I just love how cozy and special everything is put together. Your little details just bring out the magic of Thanksgiving, truly. WELL done, my dear!! Everything is just lovely, Debra. As if your litle sunporch could ever be cold and uninviting. Remember darling...I've been in there and felt the warmth that surrounds a body like, well like a plaid blanket! 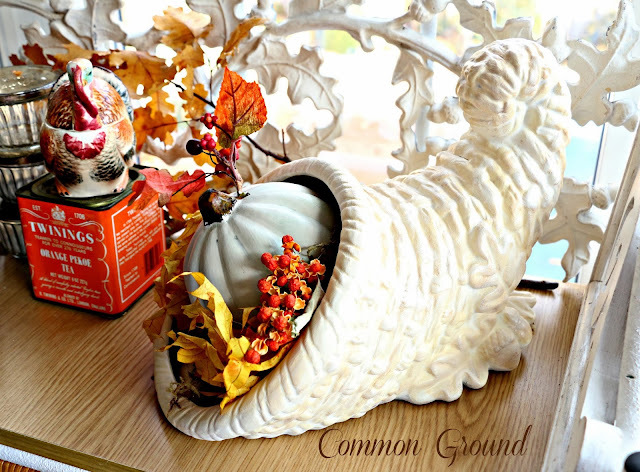 I have a cornucopia I tried to redo as well. Mine ended up looking like something a pooper scooper would be needed for...a giant PS at that! BTW...how do you clean your vintage wool blankets? I don't trust the cleaners anymore and thought you might have a little secret tip you wouldn't mind sharing. Have a wonderful Thanksgiving. I know one thing I'm thankful for and that is you! All your wool blankets are so very inviting...as always...your sunporch looks outstanding!! I had to smile at the sheep in his fall scarf. As usual, your sunporch doesn't disappoint. I just love, love all your plaid throws. I am addicted to those things. 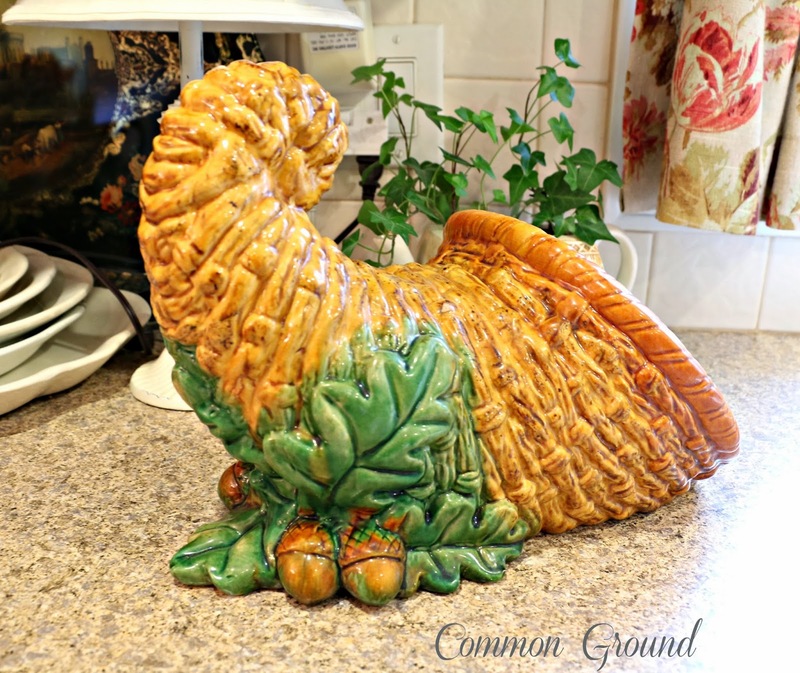 I didn't know that you could paint shiny ceramic but your cornucopia came out great. 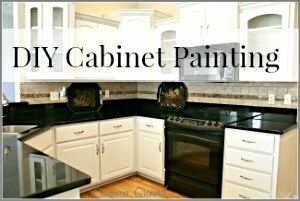 I love your sun room, it looks beautiful, and I always look forward to seeing how you have decorated it for the next season or holiday. I have a screen in porch that I haven't done anything with but put some wicker furniture in it. When I do decorate it I'm going to use your sun room as my inspiration. Pretty. Looks so fallish. Love the pumpkin pillow. 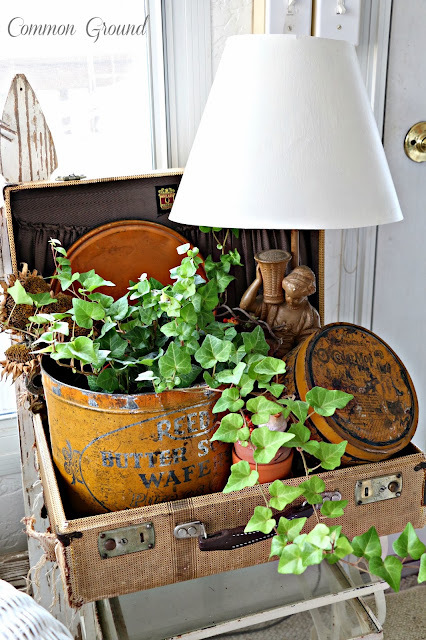 Gorgeous displays - I love the antique wooden boxes. Fabulous - Happy Thanksgiving. Debra it turned out great and I love all your fall decorations. Can not wait to see Christmas. Praying you are still feeling well. Thanx for partying at my place. Love it all - Thanks for sharing. You are very creative. 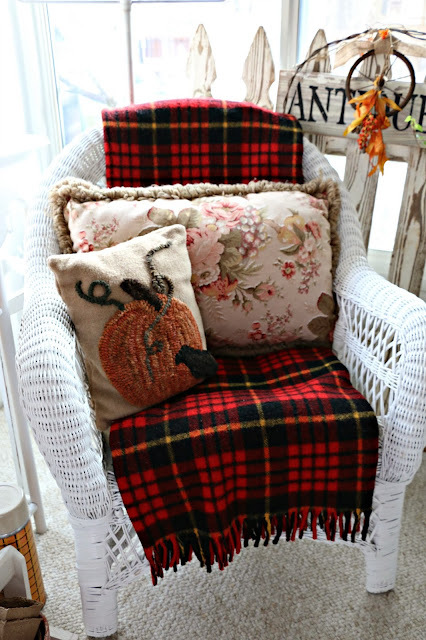 So cozy with the plaid! 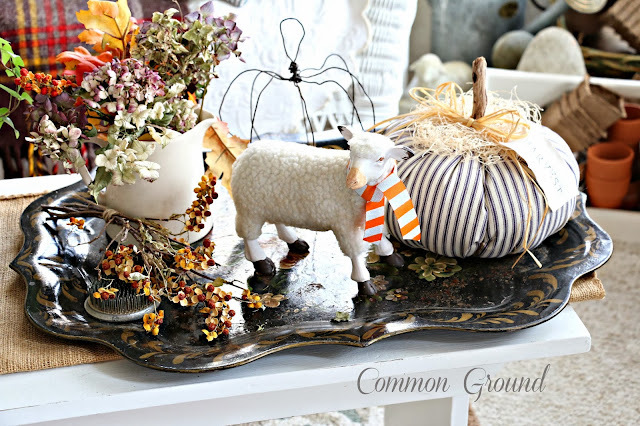 I just love your style so much and your Thanksgiving decor is very, very lovely. Love the plaid too! 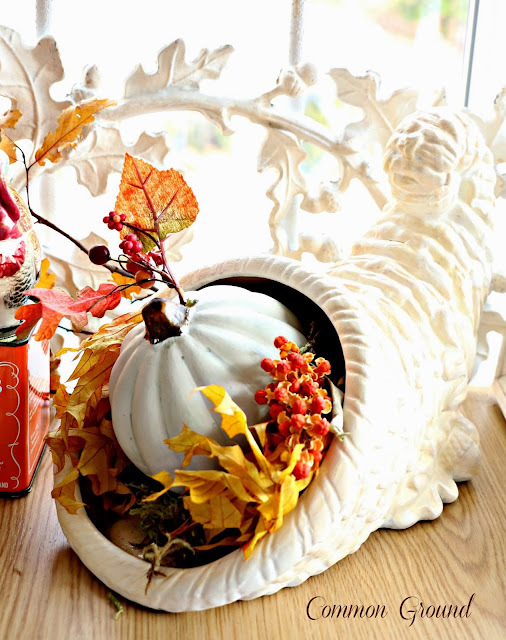 Yes, the white cornucopia is much better in white and goes so well with the turkey tureen. 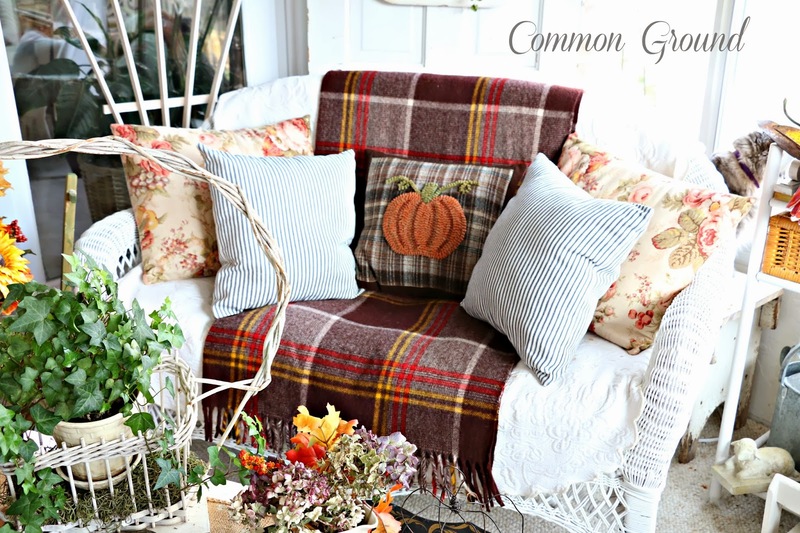 I adore all the wool plaid throws throughout your Sundporch!!! Painting the corucopia gives it an elegant appearance! I'm a bit behind this year!!! If I could, I'd have Christmas all year 'round!!! Not only is it the decor that I love, but the presence of its meaning!!! Love all your special touches!! Thanks! My favorite is the old tin in the suitcase followed by the sheep pillow on the floral on the plaid on the wicker chair. I love the layers of textures and colors you created. Oh I love how cozy it looks! With the throw on the chair! In love w/ the cornucopia transformation .. I have an old one from the 70's my Mom did in ceramic class.. It has crossed my mind to paint it. Now for sure I will ask Mom if she cares.. also love that turkey plate. Have that from Mom too but yours in in much better shape. You have a great way of decorating .. just beautiful and inviting. Yes Debra, I have a few signs of Christmas showing up. I planted my paper whites and Amaryllis and put lights in the trees outdoors. I might start on the living room. No one really spends time in there so it wouldn't distract from Thanksgiving. 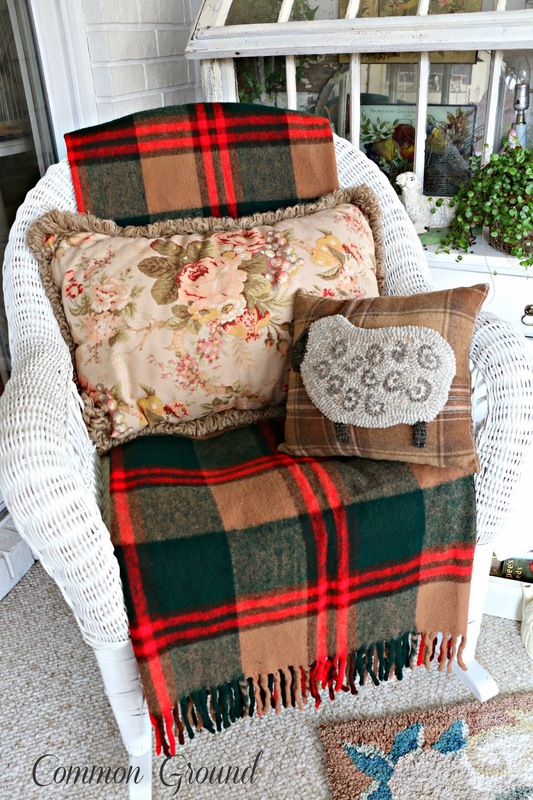 I am crazy for plaid and I love all of your throws! 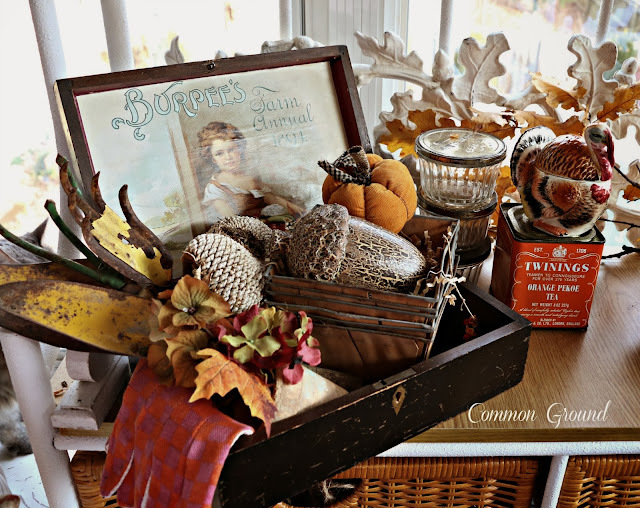 Great idea to paint the cornucopia. I bought some terra cotta turkey candle holders at a thrift the other day. Thought I would do the same thing. I'm going for a plaid theme for my Christmas porch this year. Your sun porch is always so delightful! Thanks for sharing it with SYC. Thanksgiving went neutral this year so I can transition right to a wintry white Christmas. I love what you did with the cornucopia. 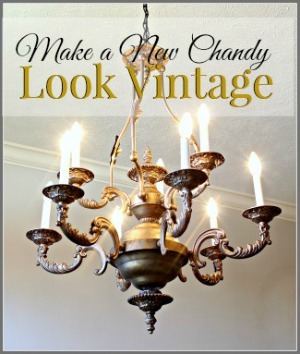 I will have to look for one at the thrift stores and copy your idea! Have a wonderful Thanksgiving!